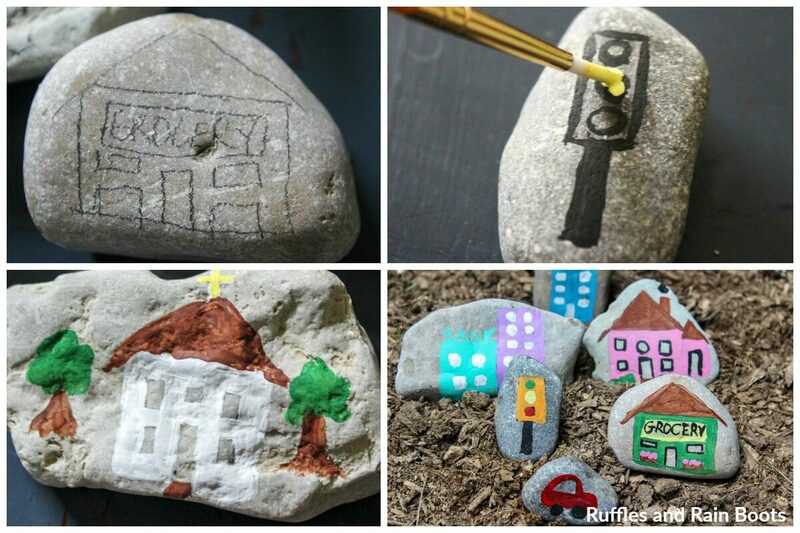 These fun rock village story stones are a great rock painting idea for kids. They can do all of it on their own, so let’s get started! 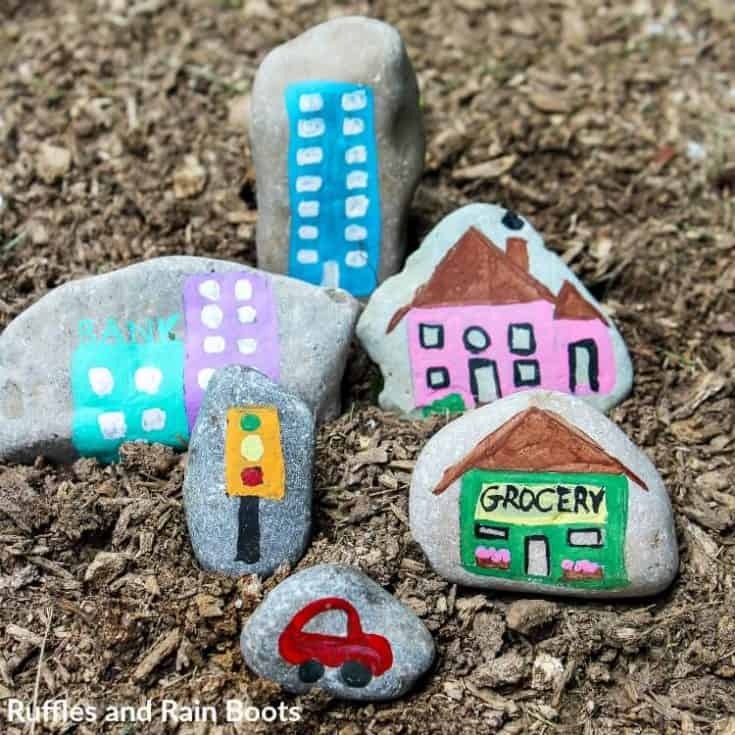 Here at Ruffles and Rain Boots, we are huge fans of story stones as a rock painting idea for kids. Each image helps a child create a tale, building their storytelling skills. Christmas Story Stones – No artistic talent required! Camping Story Stones – My daughter’s current favorite. Weather Story Stones – So many teachers LOVE these for their classrooms. 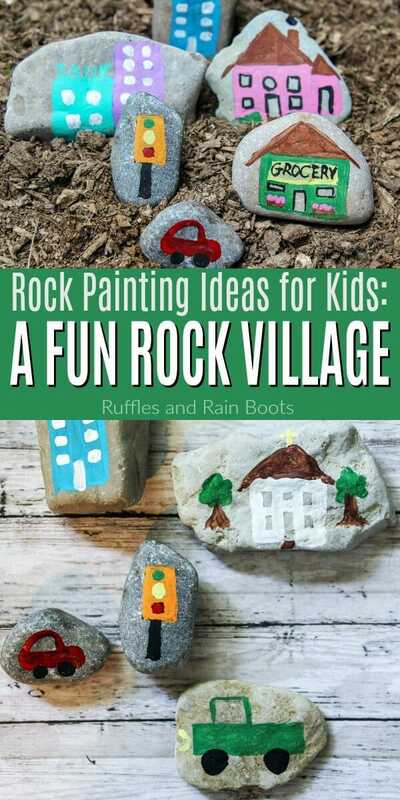 This week, we’re letting the kids create their very own rock village! This rock village is a snap to set up for kids. All we have to do is provide the paint and rocks, and the kids take over. If you haven’t already cleaned them, give the rocks a good scrubbing with soap and water. Set aside to dry in the sun or lay them out on a towel. 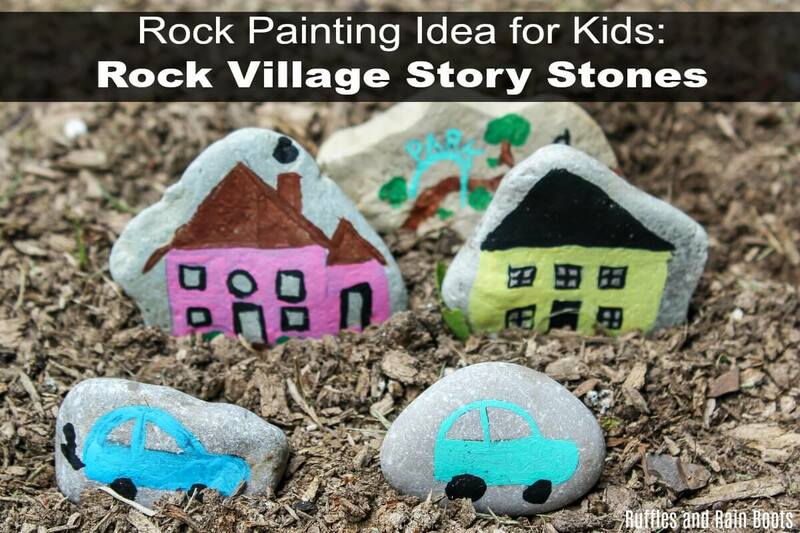 Have the kids sketch the designs on their rock village story stones before painting. It will save everyone a bit of frustration. Let them paint. Tip: for more vibrant colors on dark rocks, paint a thin layer of white before adding color over top. Once the paint has dried, cover in a sealant. For kids, a safe sealant is this ModPodge. 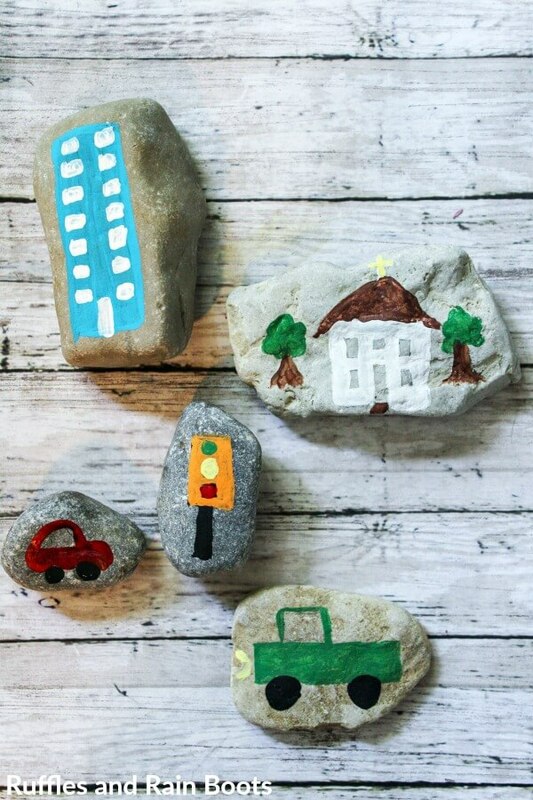 These fun rock village story stones are a great rock painting idea for kids. They can do all of it on their own, so let's get started! 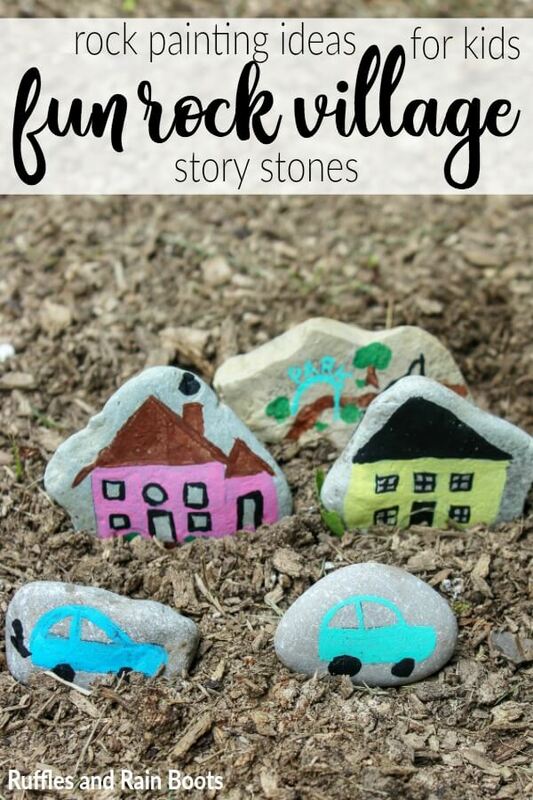 Aren’t these just the cutest rock village story stones? I love this idea for a rainy or snowy day when the kids really, really, really want to be outside playing. 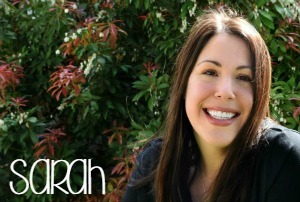 Your shares are how we grow and get more people to see these fun ideas for kids. And we are sincerely grateful.